Why Pay for Real Estate Property Flyers? Real estate property flyers now included with your MLS membership! Why Pay More for Real Estate Property Flyers? What are you waiting for? Get started today. No credit card required.​ Included as part of your MLS membership. With RatePlug, the difference is affordability. When agents invite lenders to display their rates on MLS listings, the result is the 4 bedroom 2.5 bath home in a nice area isn’t only $225,000, it’s $1,375.87 per month including principal, interest, taxes, and HOA. When home buyers have an understanding of monthly affordability, they are more likely to qualify for a loan. In fact, agents who use RatePlug close 15% faster than agents who don’t. Passive buyers become active buyers. 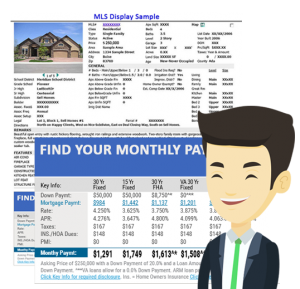 When you connect your originators to your MLS listings, you help the home buyer better understand affordability. More time on ​listings. When RatePlug is embedded in your listings, homebuyers spend more time viewing your property listings. That means better informed buyers! More support. Property flyer system generates customized property fliers right from the MLS in less than a minute. Engage active buyers. RatePlug connects the agent and originator to the MLS and the home buyer who’s is ready to buy – not just browsing. Qualify buyers faster. With RatePlug, the difference is affordability. When agents invite lenders, the result is the 4 bedroom 2.5 bath home in a nice area isn’t only $225,000, it’s $1,375.87 per month including principal, interest, taxes, and HOA. Easy compliance. All interactions between lenders and agents are archived for 10 years. RatePlug is fully FTC-MAP, TRID, RESPA, and TILA compliant.